This workshop was jointly organized by ESA’s GlobDiversity and Future Earth’s Global Mountain Biodiversity Assessment, bioDISCOVERY and Global Land Programme and hosted by the University of Zurich, Switzerland between February 7th and 9th, 2018. Approximately 30 experts from around the world attended with expertise in satellite remote sensing, LIDAR, ecology, plant science and ecological modelling. Panel Discussion led by Nestor Fernandez: How can RS-enabled EBVs contribute to global biodiversity monitoring efforts? The workshop participants were asked for their definitions of biodiversity as observed with remote sensing. Their answers were collated and summarised in a word cloud. Individual answers are listed in the table below. 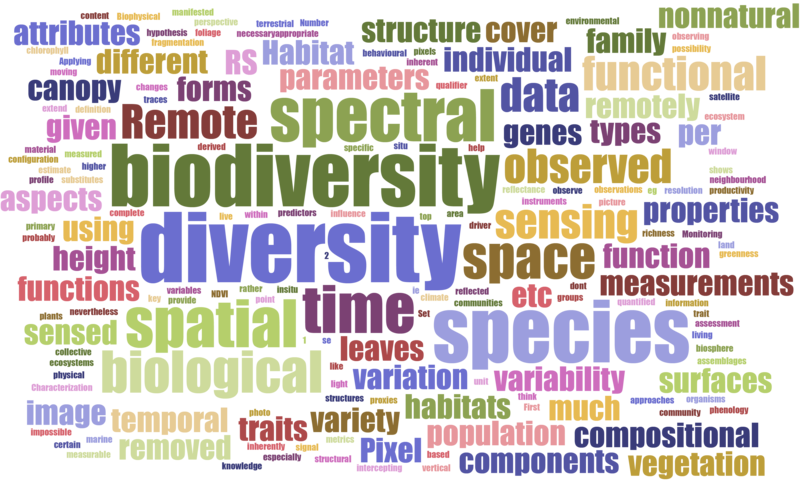 Participant's answers to the question "how to define biodiversity as observed with remote sensing?" Variety of different biological live forms that can be observed and quantified in a much higher spatial and temporal resolution than with in-situ measurements, and that can be measured using different metrics such as species richness, variety on traits, etc. Remotely sensed biodiversity is the sum total of all biotic variation from the level of genes to ecosystems in space and time. How do you define “biodiversity” as observed with Remote Sensing?